OK I did it. I admit it! There’s no one else to blame. I had no accomplices! It was all me. It was a dark and stormy night… well not really. It was sixty degrees and sunny round noon but I just couldn’t take it anymore. There it was. All big and blue. Taking up our entire yard like it owned the place. I hated it. Jared was upstairs ripping up the bathroom floor. So naive to the bloodbath, er… stale pool water bath that was about to take place in his own back yard. “I hate you pool,” I said matter-of-factly from the sun porch. I picked up a small narrow blade that was lying in a milk crate. I walked over to the middle of the yard and stooped down behind the pool decking. I didn’t want my new neighbors to know my evil potential. I stabbed. 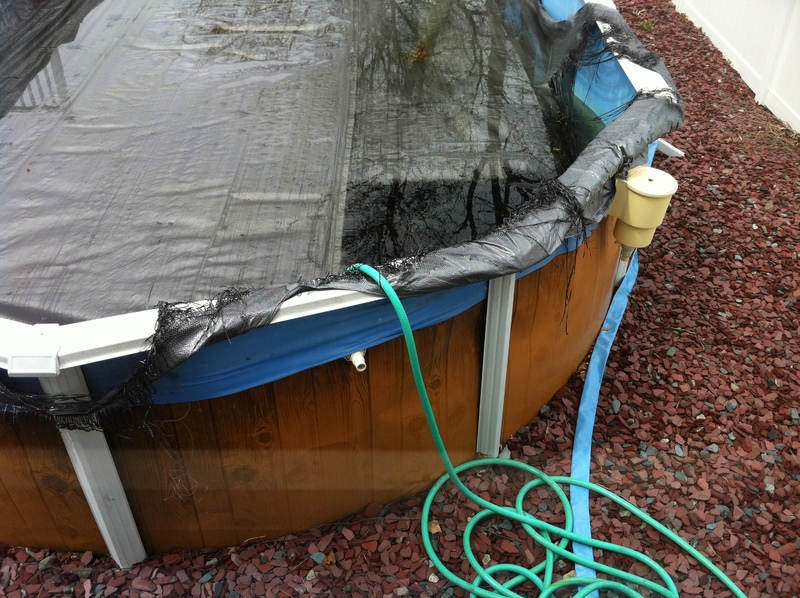 But the blade would not penetrate the aluminum pool siding. So I stabbed again. And again. This wasn’t working. Time to bring in the big guns. With a small, sharp drill bit, I tore into that siding. A perfect circle but no water. With a screwdriver I sealed the deal. Punctured the lining and watched the water seep out. It didn’t take long for me to confess to Jared. In fact, I was kinda proud of it. I single handedly killed the pool. Now all that’s left to do is tear down that aluminum and cash it in to the scrap yard for a decent profit. I feel like a hitman ready to collect their payment for services rendered. 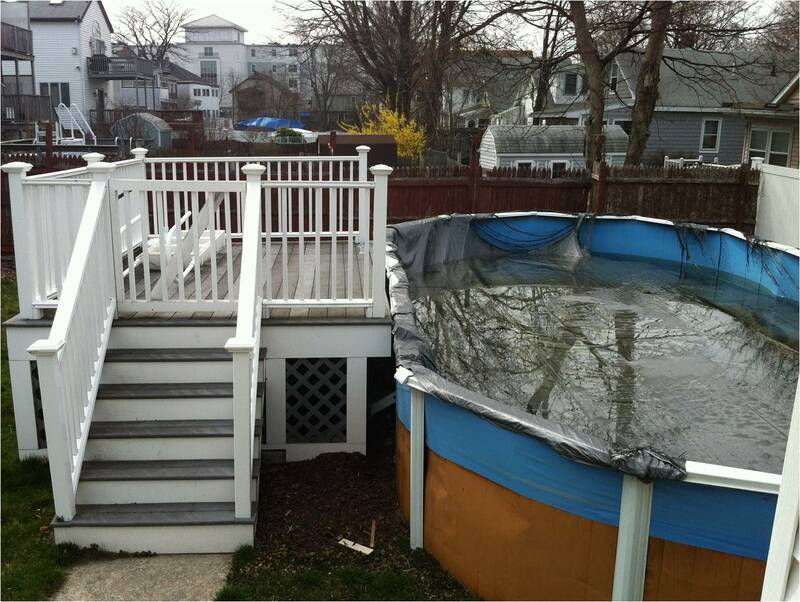 OK maybe I’ve been watching a little too much Bates Motel lately but seriously, I think above the ground swimming pools are an eyesore, a liability, and a waste of time in New England when they are open for a whole 3 months of the year. So yes, I’m very pleased with our decision to remove the pool. Even if it was slightly violent. A new home can surprise you. Whether it’s ‘Surprise! 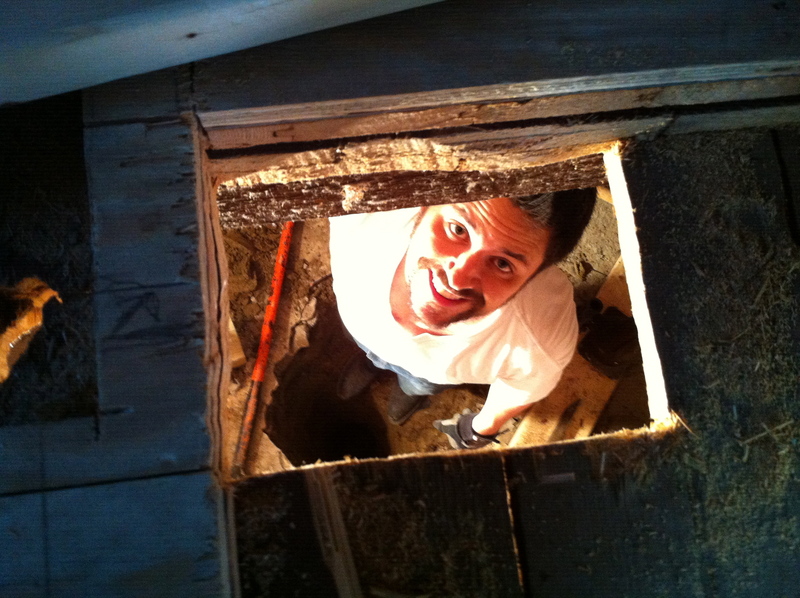 You have no insulation!’ or ‘Surprise! Here’s a really old compass someone dropped in the wall!’ Hopefully you get more of the latter and that’s what today’s post is about. We’ve found some interesting treasures in the last week. Some left behind by the last owner and some left behind by whoever built this house. 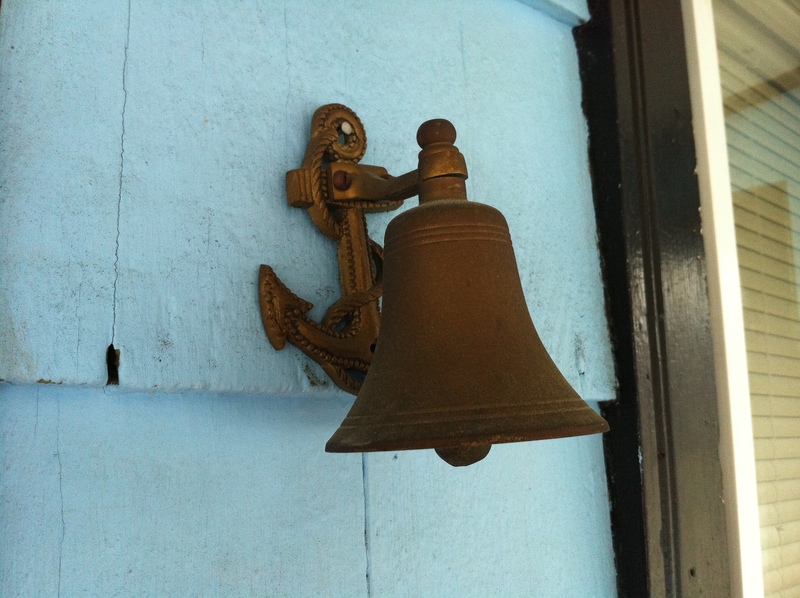 For example, check out these little treasures mounted at the back door. With a little scrubbing and a coat of spray paint, we will proudly display these in our new home! 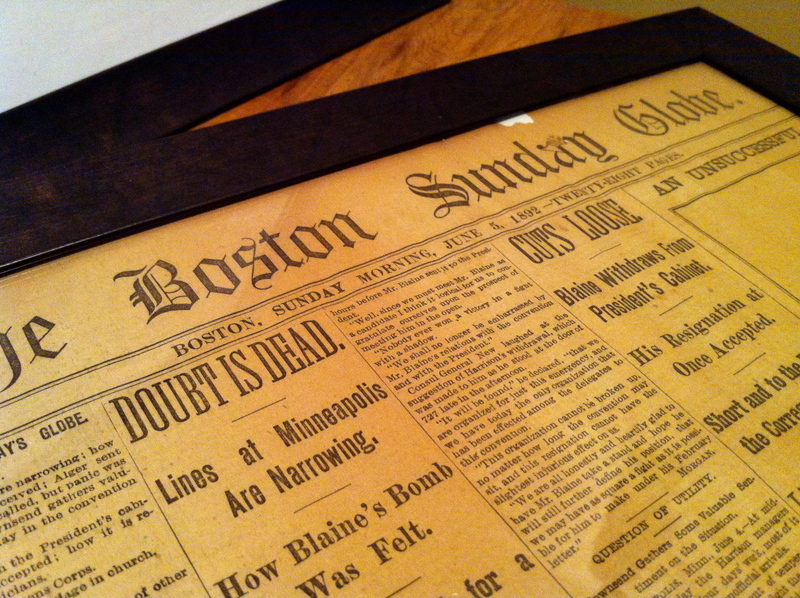 Then there was the big discovery of a Boston Herald newspaper from 1896 and a Boston Sunday Globe from 1892! We were told that this house was built in the 1920s but unless the contractors held on to a newspaper for a quarter of a century and then stuck it in the wall, we’re thinking this house may just be a late 19th century gem! 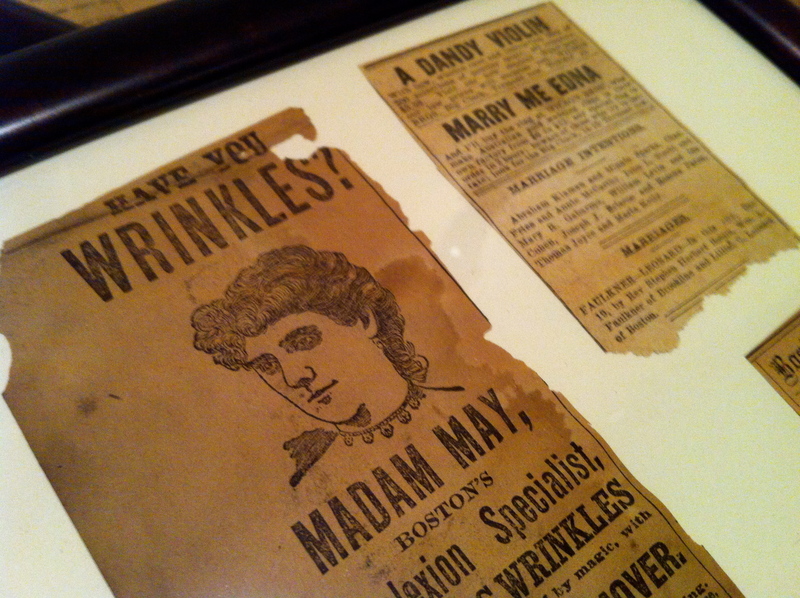 Here are some articles and advertisements I managed to save. 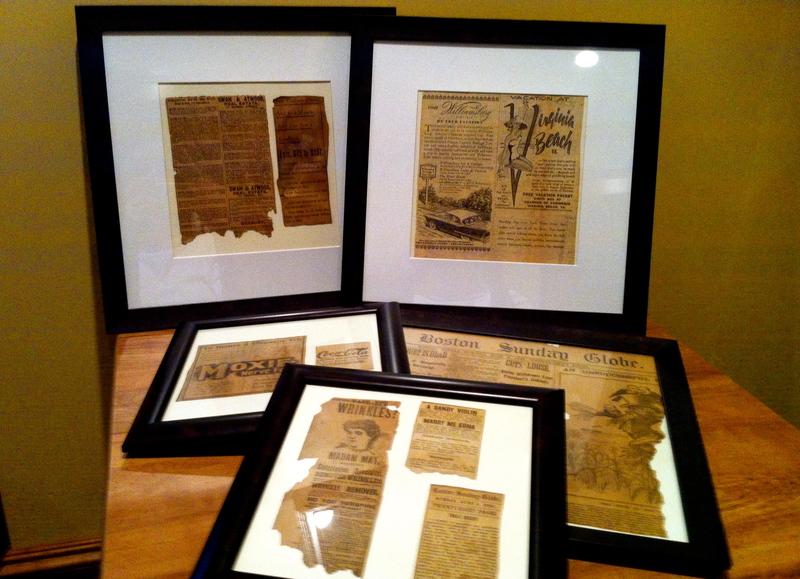 I can’t wait to display this collection of framed pieces of the past. 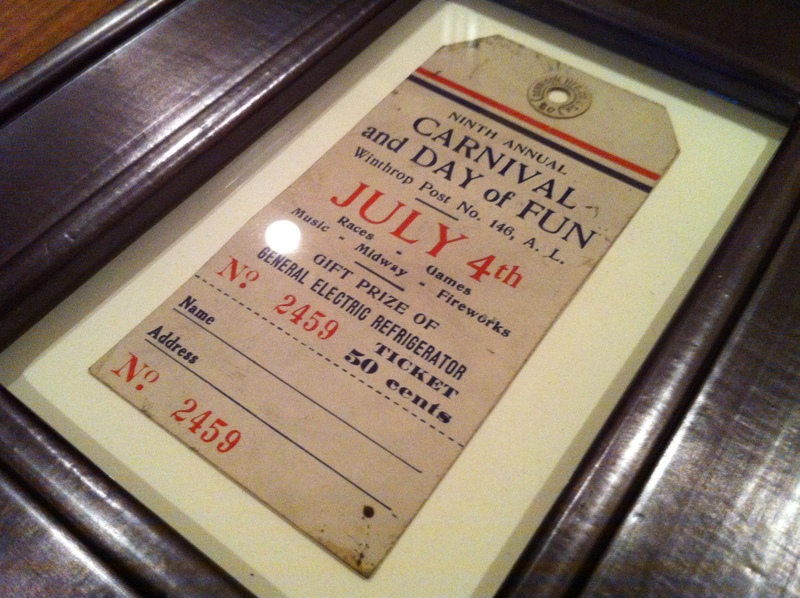 And finally, this ticket from Winthrop’s Fourth of July festivities. For as long as I can remember, Winthrop was a wonderful place to be on Independence Day. The day began with the eclectic Horrible’s Parade followed by races and games at Coughlin Park. Barbeques and parties could be seen all over town during the day and the night would conclude with an impressive fireworks display. There is no date on this ticket and I can’t find an original date for the first annual Winthrop Fourth of July festivities anywhere. According to my grandmother, she remembers buying these tickets for 50 cents and given that it’s printed in colors that haven’t faded much at all, I’d say this ticket could be from the 1940s or 50s. 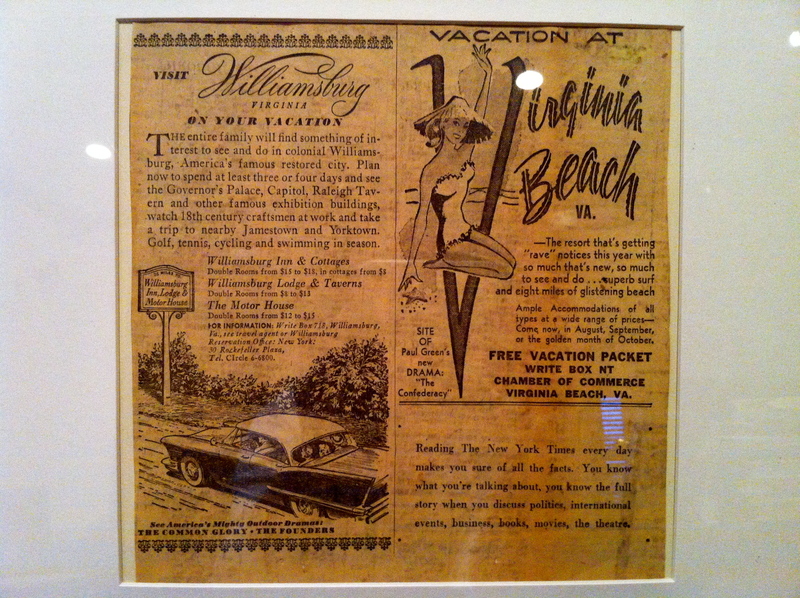 What a great piece of Winthrop memorabilia! We’ve made two edits to our kitchen plan in the past few days. The first is good news and the second is bad news… but not really. First, because we need to support the wall between the kitchen and dining rooms, we’ll need to cheat the wall further back than I intended. This just means that there will be some extra space directly across from the refrigerator that will be kitchen space rather than mudroom space. We decided to create a large cabinet to house the trash, recycling, and cleaning products. I want it to go with the rest of the kitchen cabinetry so I’ve found some options at IKEA. I’m thinking either a large wardrobe cabinet or we add two more base cabinets with pull out function for trash and recycling and add shelves above for a kitchen command center or drop zone for keys and mail when we come in the backdoor. Then the second edit to the kitchen is purely for budget reasons. Our lovely granite countertops with the look of marble will be swapped out for butcher block. I know a lot of people don’t like butcher block but I actually love the look. And in fact, it was my original intention for my dream kitchen and it was Jared that talked me into granite. Here’s some inspiration pictures to prove this will not be your mother’s butcher block! Like many older homes, we have a pretty significant slope in our mudroom and the hallway leading out to the backyard. When my Dad told me that it could be leveled before we lay down any flooring, I assumed that would mean a subfloor angled to counteract the slope. No, instead they simply jacked up our entire floor from the basement! Now to me, this seems like quite the process. But between Dad and Joe, they just went into the basement with a bunch of pipes and wood blocks and all of the sudden, the floor was moving under my feet. Anyways… this is not the end of the process but it sure did go quickly and seem like just about anyone can jack their floor up! Here’s the step by step breakdown courtesy of DoItYourself.com. You will need to purchase several beams. The beams will be hoisted by the jacks to provide the support under the sagging floor. Purchase as many beams as needed, depending on the extent of the sag that is occurring in the floor. You will also need floor jacks that you will placed under the beams. 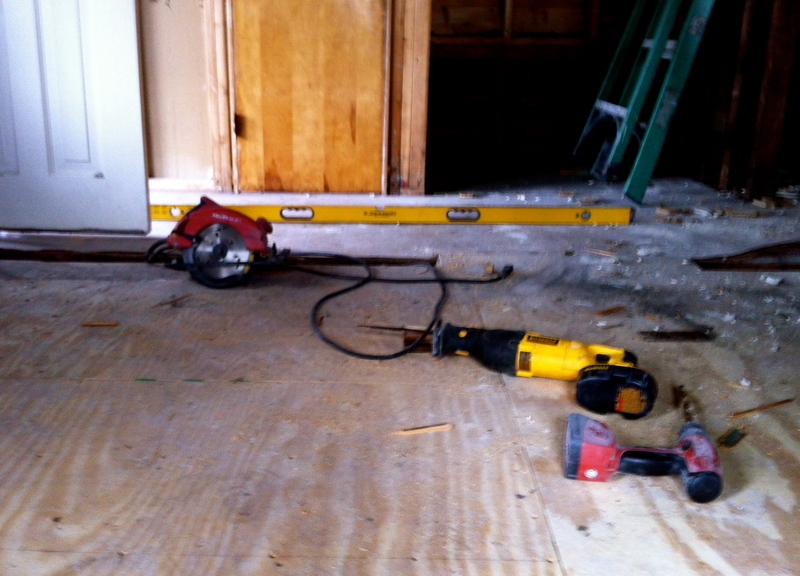 Small sags will only require the use of one floor jack, while large sags will require two or more floor jacks. On the area of the floor where the sag is the most pronounced, place a large level. Check the level as you raise the floor in order to see at what point the sag has been eliminated. It should be noted that the process of addressing a sagging floor will occur over a period of time, even several weeks if the sag is great. You will need to work on this process over time in order not to cause other structural damage to the flooring or your home. 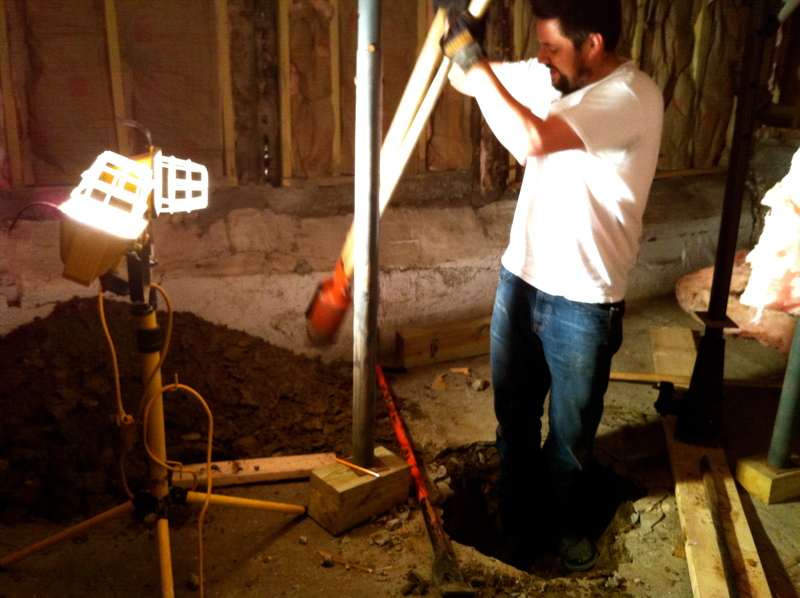 Underneath the floor, in a crawlspace or basement, position the floor jack or jacks and place the beam in position. Carefully hoist the jack until the beam reaches the floor underneath. 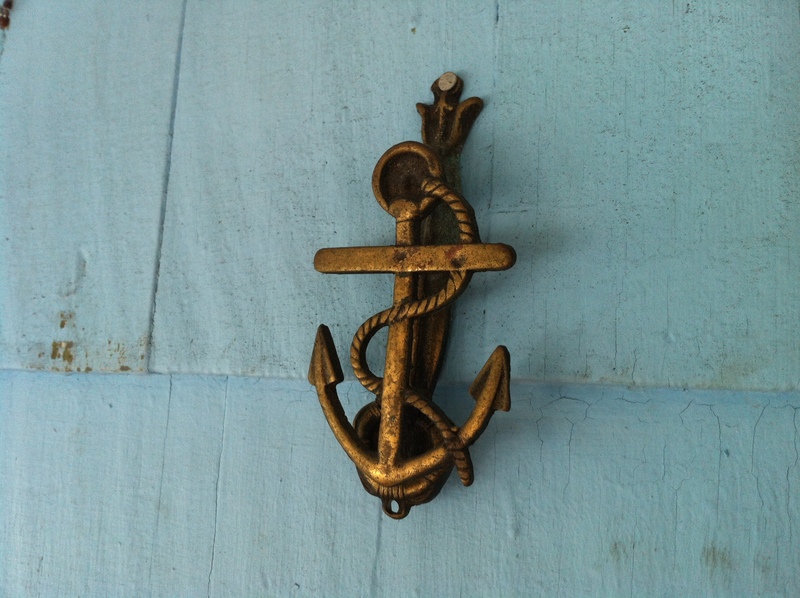 Continue to raise the jack until you feel some resistance. When this happens, stop hoisting the jack and lock it in place. Check the level to see how much of the sag has been eliminated. Wait between 1 day and 7 days and turn the jack hoist another 1/4 to 1/2 turn. You want to continue this process in the same intervals (1 to 7 days) until the level has reached the correct the position. Once this happens, you should have eliminated the sag from your floor. 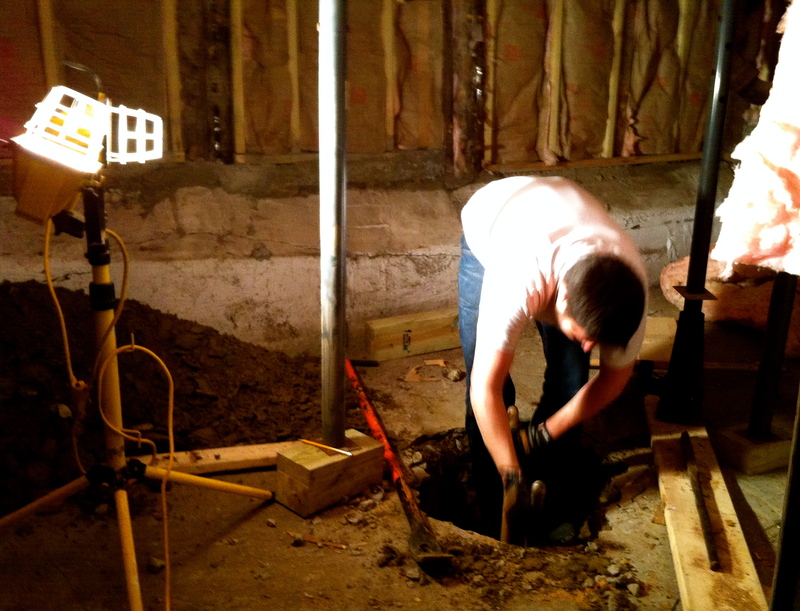 So once we had a level floor the next step involves digging a four foot hole in the basement in order to pour concrete to secure the new support. Guess who got to do that. Yup, my husband. You see, apparently there is “young buck” work on the job site. It’s an unwritten rule that my Dad and his fellow contractors implement wholeheartedly. My poor hubby has lugged buckets of plaster, thrown rolls of carpeting into the dumpster, and now has dug a four foot hole in our basement. Gotta love the man. Moving on- we’re draining the pool. 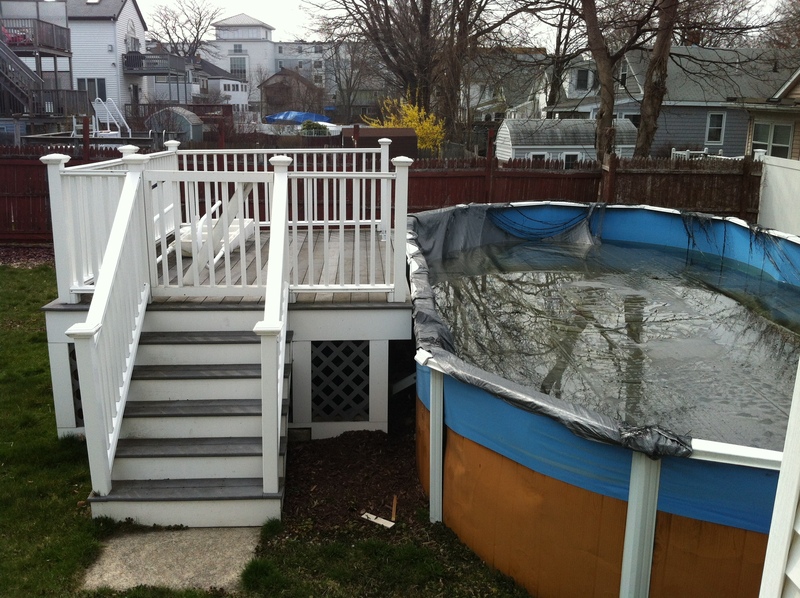 How does one drain a swimming pool exactly? I had no idea other than to open the floodgates and probably piss our new neighbors off and flood our own basement. But leave it to my Dad to know exactly how to do it- with science! I believe that if my Dad were not a master carpenter, he would be a high school science teacher. The man knows all kinds of crazy stuff about physics and astronomy. It’s like living with the cast of the Big Bang Theory! So just how do you drain a pool using science? You create a siphon with a garden hose. For this to work, the water source (the pool) must be higher than the spot where the water will pour out (the drain on the street). The water hose has to be primed, then gravity takes care of the rest. Just make sure the hose is submerged in your water source at all times. If the water level falls below the end of the hose, you have to restart the siphoning process. Here’s a step by step breakdown courtesy of eHow.com. Fill the hose completely with water. Keep the ends of the hose upward to prevent the water from draining back out. Place one hand over each end of the hose and turn it upside down. Place one end of the hose into the contained area you want to drain. Aim the other end of the hose to your draining location. This may be a bucket, floor drain or other acceptable destination. Remove your hands from both ends of the hose at the same time. Water should begin flowing out of the end of the hose that is not submerged.